There is mystery surrounding Gillingham’s decision to suspend forward Rory Donnelly ahead of Sunday’s showdown against the Cobblers at Sixfields. The Northern Irishman has played 33 times for the Gills this season, scoring just twice, but he was on target in the Kent side’s 3-2 home defeat to Fleetwood last weekend. Signed from Swansea City by then Gills boss Justin Edinburgh in 2015, the 25-year-old is out of contract this summer and it seems he has already played his last game for the club. A short statement on the club’s official website read: “Gillingham Football Club can confirm that striker Rory Donnelly has been suspended from his employment at the club with immediate effect. The development is hardly a help to Gills boss Ady Pennock as he prepares his team for their crucial clash with the Cobblers. The Kent side have to win at Sixfields to guarantee their Sky Bet League One survival, with any other scoreline meaning they are relying on results from elsewhere. 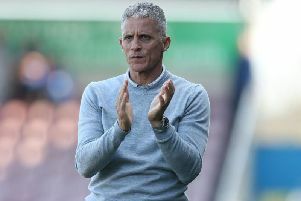 Pennock, who took the reins at the Priestfield Stadium in January following the decision to sack Edinburgh, who was swiftly snapped up by Cobblers chairman Kelvin Thomas. knows that his team’s future is still in their own hands and that is what he is focusing on. “We didn’t want it to come down to this, but it is what it is and we just have to go to Northampton and be positive and get that win that will get us over the line,” said the Gills manager. “We have to go for the win. It is in our hands and we have to be positive, we can’t go there looking for a draw and then we go and lose and are relying on other teams around us. “Our game against Northampton is the most important thing, we have to manage that and then other things will take care of themselves. We have to do a professional job. “The boys are confident, and there is the twist on it as well with Justin being at Northampton as well, so it is made for us to go there and do something. “But we’re not worried about what Justin is going to do, apart from the 11 players he puts out. “Northampton are a very good side, they have some good indivduals and they are safe so they will be going out there not worrying about relegation as they have survived, but it’s all about us.